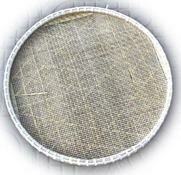 Both trays and fans are made basically by forming a woven mat into the desired shape. The trays have a strengthened rim that holds the mat all along the periphery of the form .The fans have one side of the mat tree of the rim and the grain is poured out from this side . The trays are generally used for drying grain ,or are held horizontally and moved in a sidewise motion so that the grain is separated from the chaff. Both the trays and fans may be held horizontally and jerked upwards repeatedly to separate the grain .The fans are also used by tilting them gently towards the ground so that the grain, due to its weight, falls into a pile while the chaff, with the help of a gentle breeze, is blown into anther pile. A common factor between all the winnowing trays and fans seen in the hill regions is the weave structure used in the mat. According to a craftsman, this weave has the strength required to absorb the impact load of the grain as it is being separated. It is a very closely packed weave, and generally the strips in at least one direction are made of the outer layer of bamboo. The winnowing fans have a different weave structure which may be due to their smaller size.